Ben Ray Luján is a U.S. Congressman for New Mexico’s 3rd Congressional District. He was first elected in 2014. Luján has called the Trump Administration’s reduction of Bears Ears National Monument “an attack on all of our national monuments.” He supports permanent reauthorization of the Land and Water Conservation Fund and voted to preserve sage grouse habitat protections. He also voted to block public land transfers, and criticized the lack of public input on changes to the methane waste rule. U.S. Representative Ben Ray Luján Tweeted Support of National Monuments. U.S. Representative Ben Ray Lujan Supports Permanent Reauthorization of the Land and Water Conservation Fund (LWCF). U.S. Representative Ben Ray Luján Voted to Limit Public Land Transfers. 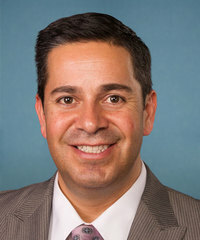 U.S. Representative Ben Ray Luján Supported Protecting Sage Grouse Habitat. U.S. Representative Ben Ray Luján Tweeted Concerns Over Changes to Methane Emissions Regulations.